Average Height	: 23" - 29"
Average Weight	: 33 - 55 lbs. Azawakh comes from the sub Sahara region of Africa. They are closely related to the Slough of Maghreb. Azawakh have a rare glucose isomerism allele that occurs in other wild dogs such as foxes, jackals and Italian wolves. DNA results show that they come from a population of Pariah dogs also called bush dogs. Azawakh are tall and elegant dogs. They are lean, muscular and swift when running. The tail is carried above the back line. The forequarters and hindquarters should exhibit very open angles. The hips must be at the same lever or higher then the withers. An Azawakh's skin fits tightly over their body. Their coat is short and fine with a commonly hairless belly. They come in a variety of colors however only sand to dark red and black brindle is recognized by the FCI. Each of the four legs must have white stockings. The Azawakh’s are friendly towards their owners but can be aloof with strangers. Their attitude towards strangers can range from friendly to curious to arrogant. They have a guardian’s instinct and will vocalize when a stranger approaches them on their turf. If proper training and socialization is given, the Azawakh can live with people harmoniously. Like other sighthounds, the Azawakh has a very high prey drive. This could cause some complications with other small household pets like cats and small dogs. Extra socialization is needed to ensure the safety of these small pets with this breed. An Azawakh left alone with an unfamiliar small animal could result badly. Because of this high prey drive, an Azawakh should not be left off leash near roads and high traffic areas. Azawakh’s tend to try and be the dominant dog in the family. If there is already a dominant dog in the family, this could cause problems. Azawakh’s are highly intelligent breed and will train easily with gentle techniques. Firm and consistent training with treat rewards work well to train an Azawakh. Never use choke or pinch collars. These training methods could injure this breed. A good training class is recommended and will help the dog bond with the owner. The Azawakh needs a good exercise routine. They have spurts of energy and require good walks and safe, fenced, open areas to run. If their exercise needs are met the will enjoy good, long naps on the sofa. Backyard exercise is not enough for this breed. They do well to have another dog to run with. Lure coursing, and racing are great ways to exercise the Azawakh. Without proper exercise and mental stimulation, this breed can turn destructive in a home. The Azawakh is generally a healthy breed. The Azawakh as a breed do have several health issues that need to be watched for. The most common health concerns are: hypothyroidism, seizures, and autoimmune mediated diseases, such as Eosinophilic Myositis, autoimmune thyroiditis and generalized Demodectic Mange. Cardiac problems are also not unknown in this breed. Bloat, though rare, has been known to occur. Traditionally, the Azawakh is the companion of the Tuareg nomads in the sub-Sahelian desert. The breed is referred to as "Aidi n'Ailluli ," meaning "Noble Dogs of the Free People." The Azawakh is considered a full member of the family, entrusted with protecting the encampment and flocks from invaders. Agile, and possessing great endurance, it also hunts hare, antelope and wild boar to provide its family with meat. The breed made its debut in America in the 1980's. 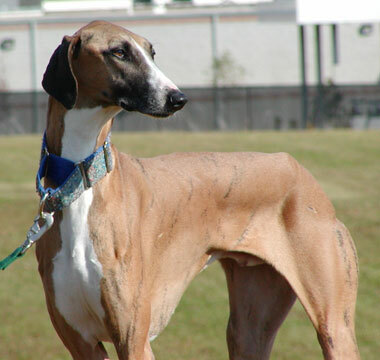 The Azawakh is a rare sighthound; they are aloof, with a complex personality, and they have the unusual characteristic of being protective. Stunningly beautiful to look at and quiet to live with, the Azawakh is not suited to every home. The Azawakh is intelligent and loyal. He must live indoors with his family, never outside with little attention. Puppies must go to their homes at an early age, and it’s not easy to re-home an older Azawakh because he has difficulty adjusting. Before you get one, be sure you are willing and able to commit to him for life. Puppies need extensive socialization to new people, places and situations, which should continue throughout the dog’s life. Unlike most sight hounds, Azawakhs have a protective streak and will bark at strangers. This is not a dog who will lead the burglar to the family silver. Sighthounds such as the Azawakh are built for speed. His thin skin is stretched over a frame of muscle and bone. He should not be fat. Ignore people who accuse you of underfeeding him. He needs regular exercise to stay conditioned and is an ace competitor in lure coursing, a sport that involves chasing a mechanically operated artificial lure. Like every sighthound, Azawakhs have a strong prey drive. He gets along with other dogs, but if you have cats or small dogs, they will not be safe around an Azawakh unless he has been brought up with them from an early age. Even so, it’s best to supervise them when they’re together and to separate them when you’re not home. And the Azawakh who gets along with small pets indoors may forget that they are his pals if he sees them running around outside. He certainly won’t have any qualms about chasing unknown cats or other small furry animals, so he must always be walked on leash. The Azawakh can live contentedly in an apartment or condo as long as he gets a daily walk or run of at least half an hour. He’s an excellent partner for joggers and runners and is then satisfied to be a couch potato for the rest of the day. Never permit an Azawakh to run free except in a safely enclosed area. An underground electronic fence does not constitute a safe enclosure, by the way. The Azawakh will run right over it, heedless of any level of shock. Although he loves to run, the Azawakh is not a play-with-the-kids kind of dog. Choose a different breed if you have young children or very active children who want a dog as a playmate. For older children who like to spend their time playing video games or reading, however, the Azawakh can be a good companion, as long as someone in the family provides the exercise he needs. This is not a breed that thrives in cold or wet conditions. With his thin skin and low level of body fat, the Azawakh needs an indoor environment with cushioned surfaces to rest his bones. Azawakhs are proud and independent. They respond well to positive reinforcement techniques, but punishment or heavy-handed methods will cause them to shut down. If you are firm, fair and provide the right motivation, they learn quickly and easily. They have been bred by the numerous nomadic tribes of the Southern Sahara as hunting and guard dogs, as well as companions. The hound's vocations were, and still are, the chase, guarding and companionship. One cannot help but appreciate their regalness. These dogs often can be seen sleeping on the low straw roofs of the village homes of their Mali owners. As a hyena or other night predators approach, the first Azawakh to see it jumps down and is quickly joined by the others; they form a pack and chase away or kill the intruder. •	Intelligent & Loyal, protective and readily Bark at strangers. •	They are a one person, one family dog ~ therefore do not adjust to re-homing if given up in their lifetime. •	Need extensive socialization from an early age ~ to people, places & experiences. •	Need to be kept on the 'slim' side. •	Not good with other small pets, small dogs or cats. they will stalk and attack them ~ which is their nature. •	Must always be kept leashed ~ as they will chase & kill any smaller animal running & playing. •	Excellent breed for joggers/runners. •	Happy to lay around the home. •	Not great with children. •	Do not thrive well in cold, wet weather. Relative to its native environment, the smooth-coated Azawakh hound mentally and structurally manifests his vocation as hunter, protector and companion. Quick, attentive, distant, proud and alert, he remains instinctively reserved with strangers and gentle with those he loves. Socialize well. Especially slender and elegant, his frame and muscles are visible under a dry, fine skin. The Azawakh has a natural tendency to guard. Be sure you are this dog's calm, but firm, confident and consistent pack leader. Does best with an owner who is even-tempered, displaying a natural, but gentle authority over the dog. Independent and exceptionally fast, these dogs can reach up to 37 mph (60 km/h).